Virtualization, cloud automation and network security were among the major topics at VMware’s 20th anniversary tech conference. 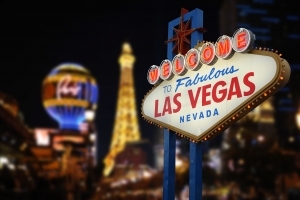 Among a massive throng of 21,000 attendees at VMworld 2018 last week in Las Vegas, a handful of vCORE engineers scoured the labs, training sessions and workshops in search of valuable, relevant insight to share with clients and the vCORE team. Somewhere between the Elvis impersonators, Stormtroopers and an appearance from NBA superstar Klay Thompson, our team found a trove of information on the latest product developments, technical trends and the human impact that makes all of the technology worthwhile. If you weren’t able to attend the conference — or even if you did, since there was simply too much for anyone to fully digest — you may find some interest in several key takeaways provided by three members of the vCORE team: Robert Johnson, Scott Reynolds and Eddie Jones. As a VMware Premier partner, vCORE provides design, delivery, integration and support services for a wide range of VMware solutions. More information about vCORE’s solutions and services is available here. During VMware CEO Pat Gelsinger’s keynote address, he was joined by AWS CEO Andy Jassy to announce some significant developments in their partnership. There have now been five iterations of the VMware Cloud on AWS since its announcement one year ago, with growing capabilities and scale along the way. The cloud on AWS is now fully functional with vSphere at the hypervisor layer, vSAN on EBS to provide the storage, and NSX to provide the networking and policy migration from the on-premise environment to the cloud. In addition, the PKS Kubernetes environment now provides a cloud native environment in addition to the traditional IaaS environment. VMs at one time from an on-premise data center to an AWS cloud. VMware can now stage hundreds of VMs using the vSphere replicator Datacenter, then at a scheduled or predetermined time, do a live VMotion of those VM’s to running instances in AWS. The days of live on-premise-to-off-premise migrations, when you can run a workload or burst to the cloud or temporarily move a data center to the cloud are now here. The popular and widely-adopted AWS relational database service, supporting Oracle and SQL, will be available for customers to deploy in their on-premise data center. This means that database developers and admins no longer need to only go to AWS to take advantage of AWS RDS. They can now test and work with it on-premise, and then use the same scripts and capabilities when they need to grow in the cloud. This is a huge step in VMWare and AWS working together. 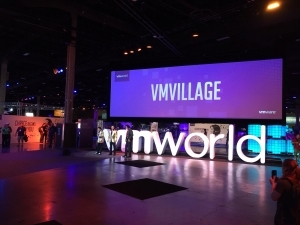 VMware showcased a lot of product enhancements at its signature event, and the vCORE team was especially excited by the new vSphere Client. All of the hands-on labs during the event used this client, which seemed much more intuitive and responsive than the vSphere Web Client. VMware is planning to add Identity Manager to the vCenter PSC services to improve SSO across VMware products. Meanwhile, they are moving away from the external PSC (Platform Services Controller), and starting in vCenter version 6.7 Update 1, users will need to run vCenter with an embedded PSC. This means prior to upgrading to vCenter 6.7 Update 1, those with an external PSC will need to re-architect their vCenter. This will basically entail adding the PSC roll to vCenter and repointing it to the new PSC. Before upgrading, users will need to decommission the external PSC. Before doing so, however, they’ll need to repoint any additional vCenter apps, such as NSX, to the new PSC. That may sound like a risky task, but VMware has developed a tool for this job – the VMware vCenter Server Convergence Tool. This will allow administrators to migrate from an external (PSC) architecture to the simpler embedded PSC architecture. vCORE can provide the knowledge and procedure documentation to help clients through this process. Also new in vCenter 6.7 Update 1, the vCenter file backup will have a scheduling module. This will allow for daily or hourly backups to an FTP server. This will dramatically reduce the recover time for vCenter. 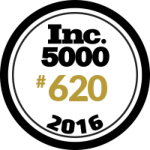 Technology is most meaningful when it unlocks powerful outcomes and significant change. In his kick-off address, Gelsinger delivered VMware’s overall strategy and put some real information behind the “Any Cloud, Any Application, Any Device” messaging. Just as importantly, he was able to point out many cases in which VMware technology is making a difference in people’s lives, because it can deliver more securely and to more people than ever before. The theme of technology as a tool to improve quality of life continued throughout the conference. In one VMworld session, Laurie Santos, a professor of psychology at Yale University, spoke about a course she has developed on human well-being. It is the most popular class ever taught at Yale, with nearly 25 percent of the undergraduate students at Yale enrolling in the course. She shared some national statistics that showed an alarming trend on the challenges and stress facing this generation of college students. Santos said over 30 percent of college students report being too depressed to function. Over 50 percent say they feel overwhelming anxiety, and over 80 percent simply feel overwhelmed by all they must do. This hit close to home for vCORE System Engineer Scott Reynolds, whose son is a sophomore in college and daughter is a sophomore in high school. The entire course is now available online for free here. 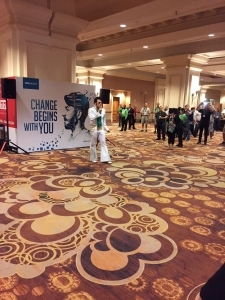 VMworld 2018 took place Aug. 26-30 at Mandalay Bay in Las Vegas.